"A healthier take on the traditional fruit square. Zero trans fats, so you can add your own by serving with ice cream!" Place chickpeas, 1/2 cup rolled oats, 1/2 cup brown sugar, 1/4 cup olive oil, 2 teaspoons vanilla extract, baking powder, 1/4 teaspoon baking soda, and salt in a food processor. Blend to a dough-like consistency; press into an 8x11-inch baking pan. Bake crust in the preheated oven until crisp and lightly browned, 20 minutes. Combine blueberries, white sugar, and lemon juice in a saucepan; cook over medium-low heat until blueberries have reduced, 10 to 15 minutes. Whisk cornstarch and water together in a small bowl; stir into blueberry mixture. Cook until mixture thickens, 2 to 3 minutes. Pour blueberry mixture onto the cooked crust. Mix 1 1/2 cup rolled oats, flour, 1/2 cup brown sugar, 1/4 cup olive oil, 1 teaspoon vanilla extract, and 1/2 teaspoon baking soda together in a large bowl until bread crumb consistency. Sprinkle over blueberry mixture. Bake in the preheated oven until blueberry filling is bubbling and crumble topping is lightly browned, about 20 minutes. Cool and cut into squares. Store leftovers in refrigerator. 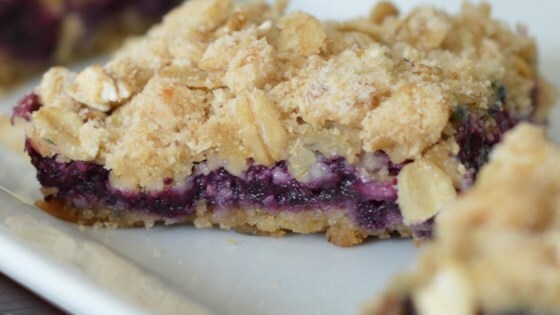 See how to make simple, scrumptious blueberry bar cookies. Surprisingly good! Served w/ a dallop of honey greek yogurt, a great snack for kids (or who are we kidding, a treat). Full of protein, fiber, vitamins. Very tasty! A bit sweet though, so I'll add less sugar. And the topping volume was too much compared to the blueberry and crust. Will definitely make it again.